First things first — WE ARE OPEN! AND we ended the first month of 2019 positive. To regularly check out our website or Facebook, monthly UICC Bulletin or the Herald for an upcoming opportunity for you to chat with Board members. Mark your calendar for our upcoming events. Have you bought your Dervish tickets yet? They are brilliant! Come out for Saint Patrick’s day weekend. Stop by our Irish library. There is always something new to explore. You could learn more about Saint Patrick and his amazing contribution to Ireland. Book your next meeting at the Irish Center. Book your next event/party/gathering at the Center with Knights Catering-Local 2 as your Caterer. Learn Set dancing on Thursday nights with Comhaltas. Learn the Irish Language on Saturday mornings. In the month of March, our library is open and promotes and supports all aspects of Irish Culture. Please take time to visit this special part of our Center this month. Storytelling for the Irish is one of the finest attributes the Irish have shared with the world. Saint Patrick is an example of one of our greatest stories ever passed down from many centuries. I didn’t know much about Saint Patrick except that he taught the trinity with the shamrock and that he drove the snakes out of Ireland. Additionally, he was a man that was brave, compassionate, determined and faithful and died at 76 years old. Our partners continue to collaborate and work with the Center and we are grateful for our deep long term relationships that have forged for the last 45 years. 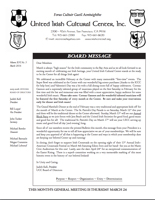 The United Irish Societies is scheduled to honor the Grand Marshall of the Saint Patrick’s Day Parade on March 1st. Rose of Tralee selection, March 2nd. The month of March celebrates St. Patrick’s Day by bringing in traditional Irish Music, food, and dance co-sponsored with our member Irish clubs. Some of these clubs include the Comhaltas Ceoltóiri Éireann and the Irish schools of dance, United Irish Societies, Gaelic Athletic Association, Irish Youth Football League, Irish Pipers, Irish Immigration Pastoral Center, and Irish American Crossroads. Check out our website to see how Comhaltas and the Irish Pipers continue to have classes promoting language, dance, and music. Some members have said that they will not pay their membership dues or make a donation without seeing “progress”? What equates to progress? Well, if I can be so frank, progress for me is that we are not in the red. That we had a positive month. Progress is that we have a fun-filled March planned and we continue to work with our wonderful partners. Almost half of our budget relies upon membership dues and donations. Progress for me would also be if we exceeded our budgeted membership dues and donation amounts. Progress would be if more members supported the Center and had faith in the future like Saint Patrick. Progress is that we have Knights Catering that is providing exceptional service and amazing food. Progress for me is planning more member events similar to the Irish New Year’s Eve and the Super Bowl gathering where families can come together. If you’re lucky enough to be Irish, then you’re lucky enough!